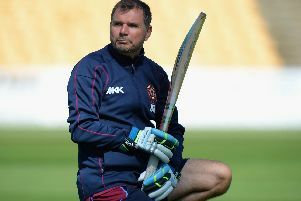 Northants head coach David Ripley admitted his side were once again not up to scratch with the bat as they fell to a third Royal London One-Day Cup defeat in four games, despite Josh Cobb’s century at Derby. Cobb hit 104, but support from his team-mates was in short supply with no-one else passing 26 as the Steelbacks were bowled out for 231, a target that Derbyshire reached comfortably with seven wickets and 10 balls to spare. Having lost six wickets for 43 on Wednesday night against Leicestershire, the middle order collapsed once against to lose six for 52 on Friday to leave them with a score Ripley admitted was about 30 under par. “We were 140 for two after 30 overs with two guys in, and to only score 90 from the next 20 is really disappointing,” said. the Northants head coach. “A run a ball gets us to 260, and I think if we get 260 we would have won the game. “It’s frustrating because the pattern seems to be we’re getting into some reasonable positions and we’re not able to push on and get a par score, we’re under par in every game so far. Cobb’s century was his first in Northants colours since his move from Leicestershire, and while Ripley was happy to see one of his top order reach three figures, was left to lament the regular wickets at the other end which forced Cobb into the holding role, rather than being able to kick on in the latter part of his innings. “I was pleased for Josh getting through, we talked about scoring hundreds but because we never got a partnership going he wasn’t able to kick on, it would have been nice if he could have gone harder at the end. “We certainly needed that hundred, we’ve been short of one-day hundreds and it was good Josh could put one on the board for us. Northants are back in 50-over action on Sunday when they travel to Worcestershire, and they then host Somerset on Monday at the County Ground (start 2pm).